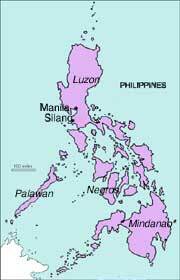 The Philippines District-in-formation (DF) was formally erected in May 2001. The number of Philipino members of the Society was judged sufficient to be able to function as an independent unit of the Society, though still needing financial support, especially for its missionaries working in Ghana and Tanzania. The SMA presence in the Philippines began in 1985. Two Irish SMA priests – Frs John McCormack SMA and Pat Kelly SMA arrived to work in a parish and seek young men who wanted to dedicate their lives to the service of Africa as SMA priests. The Philippines, with the largest Catholic population in Asia, was chosen as the place to develop an Asian branch of the Society and could be a good source of priestly vocations. At the same time the SMA was also considering “returning to its roots” in south India. The Society has two Formation houses in the Philippines and has also responsibility for a parish in Las Pinas City, Metro Manila. 1742 Las Piñas City, M.M. SMA House of Studies, 7 Bouganvilla Street, New Manila, 1112 Quezon City. The House is the Formation House and also the Vocations Department. As of December 2012 we have four students there – two studying Theology and two undertaking studies in Philosophy. This is the location for the Spiritual Year which is an essential part of the Formation programme for all SMA students. At the end of the ISY the students are admitted to temporary membership of SMA. For the present 2012/2013 academic year there are five students – 1 each from the Philippines, Kenya and India and 2 from Togo. Fr Joseph Tile Nomhwange (from Nigeria, a member of the Bight of Benin DF). Currently there are 10 SMA missionaries working there: 6 Filipino and 1 each from India, Ireland, Nigeria and Togo. The DF Superior is Fr Alan de Guzman SMA who was ordained in 2003 and until his appointment in 2010 was working in Ghana. He is assisted, as Vice Superior, by Fr Jerson Pineda SMA and Fr German Patiga SMA as DF Councillor. – Fr Roy Marana is on the Formation House staff at Sowutuom in Ghana. – Fathers Raulyn dela Pena Estalane and Julieto de Casapao are in pastoral work in Tanzania. Previous articleSpiritual Year Calavi has a blog!